Growing up my best friend was Greek. We lived in a small midwestern town, having a Greek friend seemed somehow exotic to me. Her family didn’t eat the usual midwestern foods; they ate traditional Greek foods like; dolmades, spanakopita, baklava, Greek salads, lots of plain yogurt, meze plates with feta cheese, Kalamata olives and grapes, spit-roasted lamb, and dyed red eggs at Easter. Their everyday meals were such a contrast to my family meals. Going to her house for dinner was a treat, I was motivated to try my hand at making baklava (all those phyllo pastry layers), spanakopita and even dolmades. Etched in my memory is the first Greek salad my friend made for me, the crunchy cucumbers and red onions mixed with sweet, acidic tomatoes, briny Kalamata olives, and creamy, tangy feta cheese all seasoned with dried oregano, fresh, bright lemon juice, and extra virgin olive oil. I remember thinking my iceberg salads drowning in gluey sweet salad dressing were no match for this new found now favorite salad. What their family did not have on their dining room table was Greek wine. Years later I would move to Germany and experience the popularity of Greek restaurants. I am guessing vacationing Germans acquired a love for Greek food and hence the Greek restaurant boom was born. The food served was gyros, souvlaki, Greek salad, tzatziki, and besides lots of German beer, the Greek wine was retsina. My first sip of retsina tasted like sharp pine resin; I was not a fan. While I whole heartily embrace Greek cuisine, this taste of retsina left a lasting impression resulting in a Greek wine void in my life until now. This month the Wine Pairing Weekend Group is taking a closer look at Greek wines and food pairings. Join the conversation on Twitter Saturday, September 8th at 11:00 am ET following the hashtag #WinePW. For more Greek wine and food pairings look for their posts at the end of this one. Since that last sip of retsina, the Greek wine industry has modernized making vast improvements in quality and is gaining momentum. According to the National Inter-professional Association of Vine and Wine, “from 2011-2016″ …sales of Greek wine in North America have increased 39 percent in the U.S. and 55 percent in Canada…” The Greek wine industry is focused on making wines from indigenous varieties like; Assyrtiko, Muscat, Roditis, Savatiano, Agiorgitiko, Limnio, and Xynomavro. 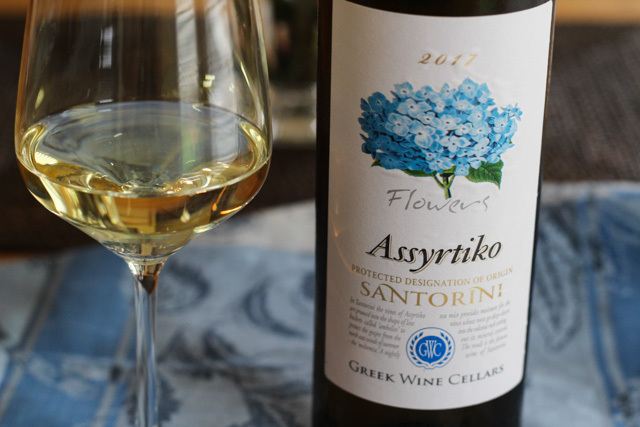 Assyrtiko seems to be the variety gaining traction in the U.S. I found a bottle of Assyrtiko at my local Total Wines. Unfortunately, the overall selection of Greek wine was still modest. The Greek Wine Cellars was founded in 1895 and is located in Markopoulo 30 kilometers northeast of Athens in the heart of Attica. Founded by Vassillis Kourtakis (1865-1946), the first person in Greece to obtain a diploma in oenology. Santorini a volcanic island with soils rich in volcanic ash. Bright pale golden in color. High acidity and light+ body. Refreshing citrusy notes with minerality. A hint of bitterness on the finish. Souvlaki a traditional Greek dish made with grilled meat, I used pork with a lemon herb marinade served on homemade pita bread with tomatoes, onions, herbs, and tzatziki. 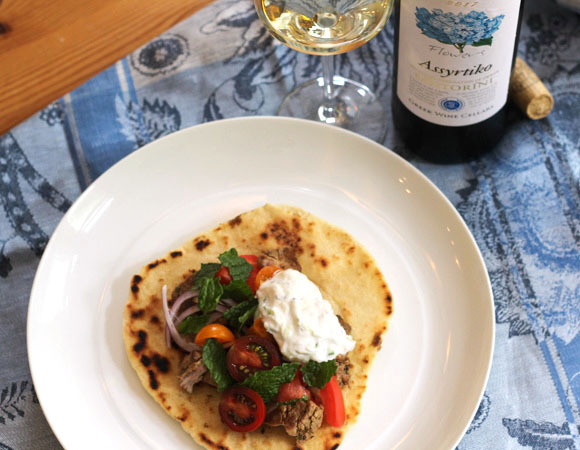 The acidity and citrusy notes in the Assyrtiko are matched in the tomatoes and tart yogurt, but balance the creaminess of the yogurt and marinated pork. The overall freshness in the wine makes for a congruent pairing with the souvlaki. Traditionally souvlaki is grilled on skewers. For ease of preparation and serving, I sauté the meat in a cast-iron skillet. I served from a large platter with all the sides and let my guests assemble their own. I made pita bread using the Kitchn “How to Make Homemade Pita Bread” Link here. The fresh pita bread is well worth the effort, but store purchased naan flatbread can be used. Cut the pork into 1-inch size pieces. Set aside in a bowl. In a medium bowl combine oregano, lemon juice, extra virgin olive oil, salt, and pepper to make the marinade. Take out 3 tablespoons of the marinade drizzle it over the pork pieces and toss. In the remaining marinade add the onion slices and toss. Set aside. Heat a cast-iron skillet over medium high heat. Add 2 teaspoons of olive oil to the skillet and half of the pork cubes. Sauté for about 5 minutes or until meat is golden brown and cooked. Transfer to a bowl. Repeat with the remaining pork. Strain the onion slices from the marinade, drizzle the remaining marinade over the cooked pork pieces. 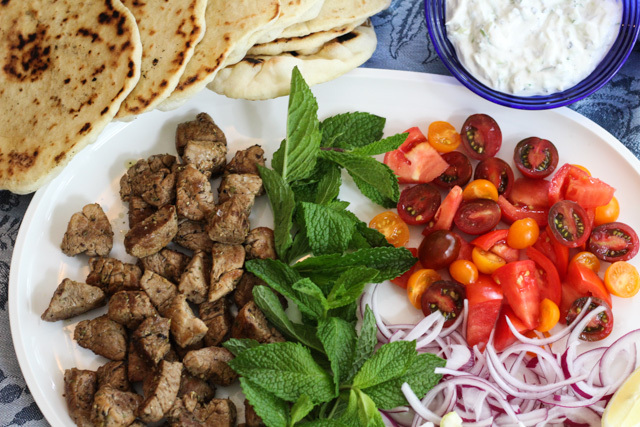 To Serve: Arrange the pork, tomatoes, onion slices, lemon wedges, and pita bread on a large platter. Serve with Tzatziki and mint. In a medium bowl combine all the ingredients and mix well. Serve immediately or store in the fridge. Your dish looks like the Greek salad you fell in love with as a girl – wrapped up in a homemade pita! I’ve never tried making souvlaki or pita but your description makes it sound like it’s worth the effort. You are right, I guess I was dreaming about Greek salads too! Your souvlaki looks beautiful and your pairing sounds wonderful! What a treat! What a great pairing! I would have loved growing up with a Greek friend if they always had Spanikopita! One of my favorite foods!! Sounds like you had a tasty early introduction to Greek food! This recipe sounds great, I need to try it! Mmmm. 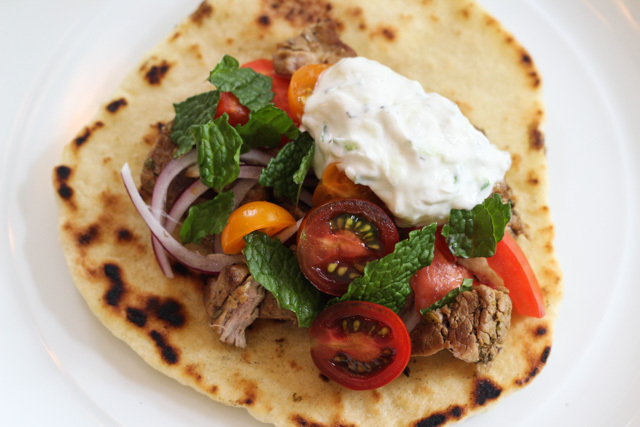 I’ve never made my own Souvlaki — I might have to try this!